3M™ 8934 Transparent Filament Tape is fiberglass-reinforced tape with a synthetic rubber resin adhesive. Light-duty tensile strength, nick resistance, abrasion resistance, and good handling for utility bundling, reinforcing, and pallet unitizing applications. Ideal for light duty strapping, bundling and reinforcing. Our synthetic rubber resin adhesive provides good adhesion to most fiberboard surfaces, and a variety of plastics and metal surfaces. Use 3M 8934 filament tape to bond together heavy items by successive overlapping. 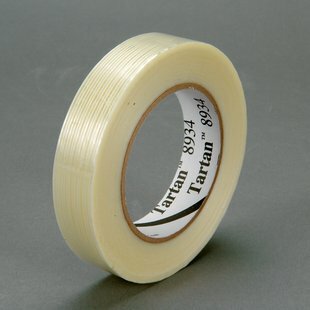 The fiberous nature of the tape can form a rigid and sturdy wall-of-tape which keeps the items extremely tight and snug.